Most of the information provided in our publications and at this site applies to the process industries overall - it is not industry specific. Procedures for vessel entry, say, are applicable generally. But each industry does have its own special issues and concerns. Therefore it is useful to understand the key features of the various industries and what differentiates them from one another. Activities to do with the exploration and production of oil and gas, both onshore and offshore, are generally referred to as Upstream. The processing of the oil and gas in refineries and the manufacture of chemicals and petrochemicals are Downstream operations. 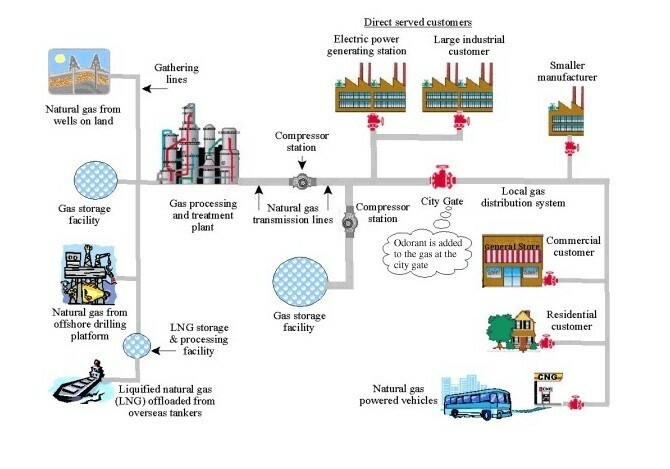 The pipelines which connect the two are often referred to as Midstream. Transportation of chemicals by truck, train and barge is also included in the midstream category, as are some gas processing operations. 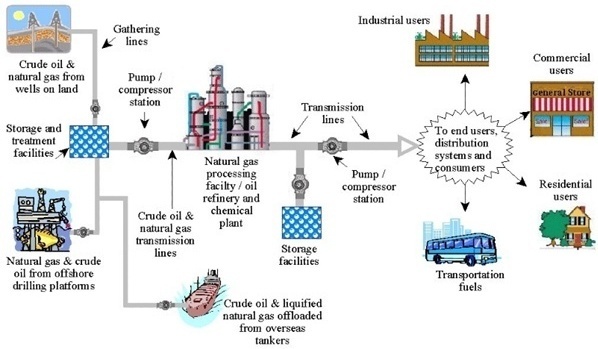 The following two sketches, both of which are published by the U.S. Department of Transportation at their Pipeline & Hazardous Materials Safety Administration, show the flow of oil and gas and the uses to which these materials are put. The first is to do with the distribution of oil from the wellhead to the final user. The sketch provides the following information. Crude oil comes from a variety of sources: wells on land, offshore wells and tanker imports. The oil is collected in storage tanks where it may undergo a preliminary treatment for removal of undesirable components such as water and dissolved salts. From storage the oil is pumped to oil refineries where it is separated into a large number of useful product streams such as gasoline, diesel, fuel gas and tar. Although most of a refinery's production is used directly (for example, as motor fuel) some of it is sent to chemical plants which produce an enormous number of products such as plastics and industrial solvents. As materials transit the pipeline system storage tanks are provided in order to provide buffer capacity. The second sketch is to do with the distribution of natural gas from the wellhead to the final user. The gas comes from offshore and onshore wells. It is compressed and sent to gas processing facilities that remove undesirable components such as hydrogen sulfide (H2S). Some of the articles, safety moments and other publications to do with safety in different industries are listed below. Process safety consultants usually find themselves working for a range of different companies and industries. (This variety is one of the most satisfying aspects of the work.) And, wherever they work they run across the statement, “But we’re different, you know”.